I was once a big Tim Burton fan and still have a soft spot for him in my heart, but I must admit that in recent years I approach every new Burton film with a great deal of cautiousness. Despite being one of the best known directors in Hollywood today, Tim Burton hasn’t quite been on song in the last decade. After making some really original and brilliant movies in the 1990s (Edward Scissorhands, Batman, Ed Wood), in recent years his movies tend to have underwhelmed. Movies like Charlie and the Chocolate Factory and Alice in Wonderland didn’t really need to be seen because they were exactly what you imagined when you first read that Tim Burton was going to make them. There wasn’t a surprise. While Dark Shadows doesn’t really see Burton breaking any new ground – which will be fine by his many fans, but frustrating to those growing tired of the usual Burton/Depp shtick – it does prove to be a bit of a return to form. 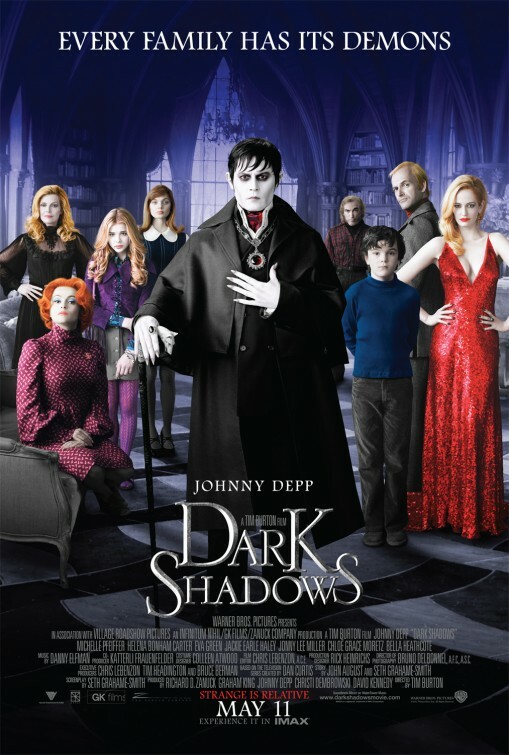 An adaptation of a cult 1960s supernatural soap opera, Dark Shadows is the latest in the line of recent Burton adaptations and re-imaginings following on from Alice in Wonderland, Charlie and the Chocolate Factory and Sweeney Todd. The film follows the story of Barnabas Collins, a vampire whom having been buried alive for almost 200 years is dug up in 1972 and sets about trying to restore his family’s seafood business to its former glory after it has been run into the ground by business rival Angelique, who also happens to be the witch who turned Barnabas into a vampire. Burton and Depp were both great fans of the series in their youth, so unlike some of the other adaptations which feel like they’ve just applied the Tim Burton formula to a pre-existing story, in this case the affection they clearly have for the source material really comes across. The contrast between the garish sights and sounds of the 1970s and the more gothic elements of the story really plays to Burton’s style, which has always been a mix of gothic and kitsch. Depp plays Barnabas as an old-fashioned, Romantic-era vampire, and much comedy is drawn from Barnabas struggling to get his head around 1970s culture. Dark Shadows is easily Burton’s funniest film since Ed Wood, possibly ever. For someone who was getting used to being disappointed with Tim Burton’s films, Dark Shadows was a pleasant surprise. This is not Tim Burton at his absolute best, but it is as close as he’s been for a number of years.